Have you ever stopped to check your Bank Account and realize fee's are being taken out left and right? I'm talking about Fee's just so you can have access to your money! It makes zero sense and there just has to be a better option. And I'm not talking about the options you see on Social Media that claim they offer low APR Credit Cards or the ones the Celebrities are advertising. I want a company I can trust with my money. And that's where American Express comes in. American Express Serve Cash Back is a full service reloadable prepaid account that offers convenient and easy access to money management tools at no or low cost PLUS cash back on everyday purchases. I love everything that American Express Serve offers. It's easy to use and I get Cash back! I have the options to use free, early Direct Deposit, or transfer money by linking the card to my debit card! I can Pay bills, buy groceries, shop online, withdraw cash from over 24,000 MoneyPass ATMs, and use virtually anywhere American Express Cards are accepted. It's a win win for me. Now let's talk about all the amazing things American Express Serve Cash Back offers. You get 1% Cash Back for every dollar you spend AND Cash back is added to your account right away. Every time you buy groceries, pay bills, or for me make dance payments you get Cash Back! How awesome is that? Plus, I have the access to even more benefits that include 24/7 American Express Customer Service, purchase Protection, which protects eligible purchases made with the Card against accidental damage and theft for up to 90 days from the date of purchase and Roadside Assistance Hotline I can call in case of emergency for reliable service. I get all of these Services at Low or No Cost and peace of mind knowing my money is safe and I can access it anytime I want. Want to try American Express Serve Cash Back? Simply Register on-line to get a prepaid card in the mail for free. Or purchase the card at a retailer for up to $3.95 depending on the retailer. There are no credit checks, minimum balances or hidden fees. 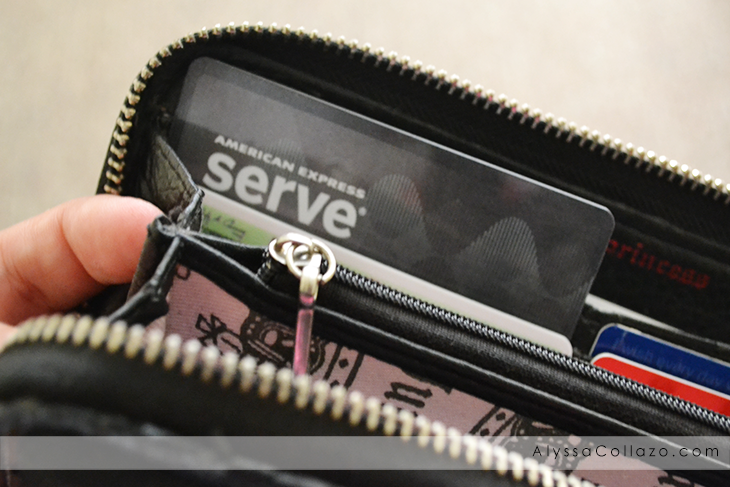 You have nothing to loose and so much to gain with the American Express Serve Cash Back Card. Be sure to follow American Express Serve on Facebook and Twitter. This is great! I always use a prepaid card when I travel. That way, if my wallet is ever stolen, they thieves can't get more than what's on the card. That would be great. It's such a good idea that it is prepaid....I might actually be able to stick to my budget. Oh how I love cash back! I need to look into that because that would be awesome! This is something I could use. I love that it is prepaid and I definitely love the cashback offer. Prepaid cards are the best way for us to keep within budget. While traveling abroad, it would even be more difficult because we have to keep converting into local currency. With a prepaid card, we can make sure that we only spend what we plan on spending. We have one prepaid card that we usually use when purchasing gas and goceries. It's a great way to stay in your spending limit. This sounds like a great option. You could even use something like this for your child when they go off to college. Just load it with a set amount of money each month to take care of their basic needs. This sounds pretty good. I will have to check it out. Thanks for sharing. I'll definitely have to get one of these the next time I travel. Thank you for the heads up!